It is a common misconception that a lack of space can limit creativity as far as organizing and decorating your home to maximize comfort. The process that is the most successful to get the best use of any space is to think outside the box, and never is this more true than where you lay your head at night. So what are 100+ ideas how to transform your small bedroom into a calming sanctuary? If you have the means, your method of storage should always start with the walls of your closet first, and drawers and hangers last. This seems completely counter-intuitive to standard ways of organizing, but you will begin to find that you do not need that much to ultimately cover the floor. Pieces of furniture like dressers are the biggest enemy in compact living, so it is smarter to use all of the walls beforehand. Hats, purses, ties, scarves and just about any accessory item you can think of can be slipped onto hooks in a jiffy. Hooks are your best friend because they can typically be installed in less than a minute, and are easy to remove and mount somewhere else if the situation calls for it. 1. They can be a solid place to keep your shoes and personal items, and 2, it grants you the freedom to place decorations that are aesthetically pleasing to the eye. A small bedroom is not a sanctuary without ambiance that is undisturbed by a rampant mess. 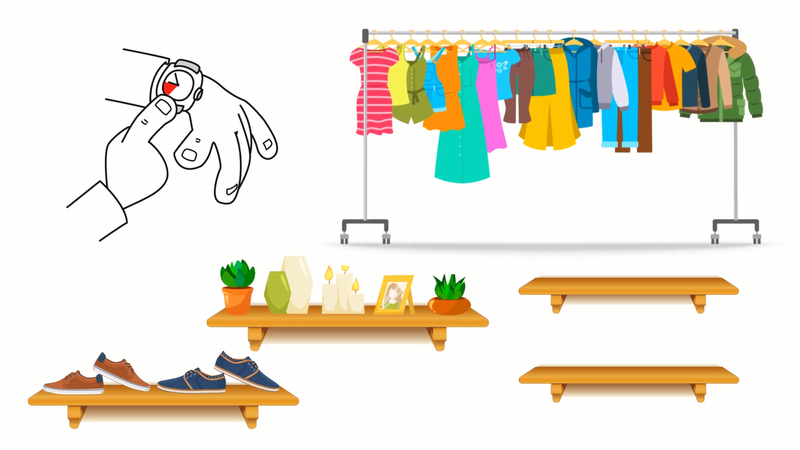 If you are in the boat of having way too many clothes for your own good, try using baskets that can stack and are on rollers. This way, you can pull them out and push them in at will where they are not always sticking out. When your hobbies start to overrun your bedroom, placing the items in a moveable cart is your best option for a plethora of reasons. Not only are they inexpensive, you have the ability to roll your frisbees, baseball gloves, sewing items, scrapbooking gear and whatever else wherever you need to. Your arts and crafts always stay in the same place, and can be shuttled around, or placed in the closet when not in use. Every bedroom needs to have some shelves in it so you can store your essentials, as well as a few decorative objects. But, you also need to have a table where you can eat and possibly get some work done. So, how can you fit both a shelf and a table in your small bedroom? Easy! Just build your very own Murphy shelf table. They’re incredibly easy to make. What’s more, if you already have a shelf, you can simply upcycle it. Before you start making your Murphy shelf table, you need to paint your MDF board so it matches the color of your shelf. Since you’re going to keep your shelf table on the floor, you can add some wheels to it. That way you can easily move it around. Once you’ve screwed in all four wheels, it’s time to add the leg mounting plates to the MDF board. Make sure to secure them tightly. Next, add some hinges on the top side of the shelf. You need to add at least two on the side of the shelf where you plan on adding the MDF board. When you’ve secured the hinges onto the shelf, turn it upside down, so the screws are on the floor. Now, lay the MDF board over the hinges and tighten the screws. And that’s it! 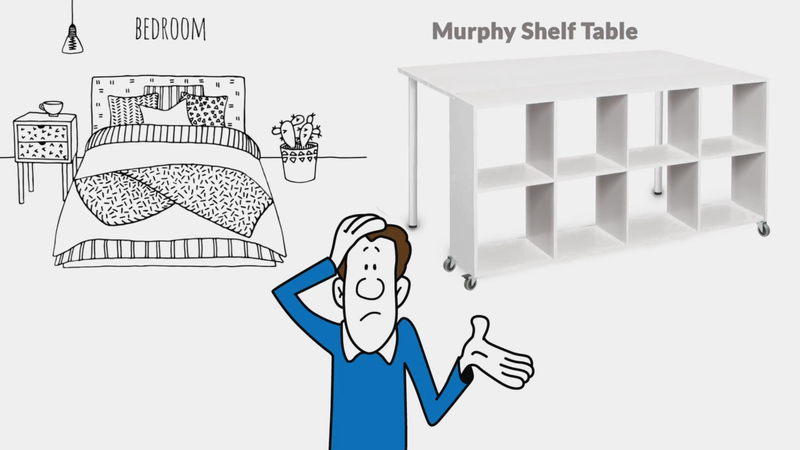 You’ve now made your very own Murphy shelf table! You can place it against your wall when you’re not using the table, and it looks just like a shelf. When you have guests over, they’ll be amazed when you turn that innocent looking shelf into a table! What happens to the legs when you fold the shelf down?